In keeping with the upcoming Valentines Day we at Fly Casino thought it fitting to feature this particular slot machine which theme highlights the mood. 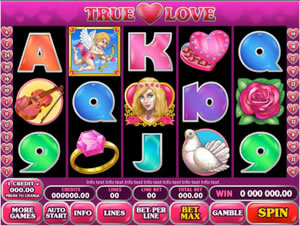 True Love is a 5 reel, 15-line game and has a romantic theme with symbols such as doves, cupids, roses and hearts appearing on the reels. Maximum bet is 10 coins per line for a 150 coin total and coin sizes start as low as one cent. All Cupid symbols are wild, which means they substitute for everything but the scattered girls. Getting five Cupid symbols on any active line pays the top award of 10,000 coins. The wild Cupid symbol also doubles any win. From 00:00 GMT until 23:59GMT, all Omni Members are invited to receive a 50% bonus on your first deposit of $/£/€10.00 or more up to 100.00. From 00:00 GMT until 23:59GMT, all Omni Casino members are invited to receive a 125% bonus up to 250.00 on your first three deposits of $/£/€ 20 or more.